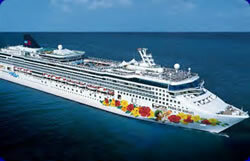 A2Z was contracted by Waste Management of Florida to dispose of APHIS (Animal and Plant Health Inspec-tion Service) waste that was on the Pride of Hawaii, Norwegian cruise Lines newest ship which sailed from Holland (where she was built) to Baltimore to take on stores and crew members on her way to Hawaii. A2Z had drivers who worked 12 hour days for six days including the weekend. Each type of waste on the ship was handled in a very strict manner. All food waste, because it originated in a foreign country, was loaded in containers with a tight lid that met U.S. Customs' standards. More than thirty, 30yd containers were provided to ship the waste to a qualified local incinerator. 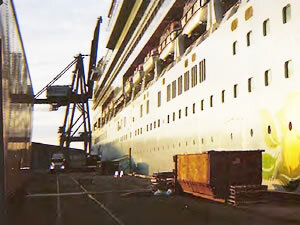 The A2Z supervisor was required to stay on site during loading operations. Once the container left the site for disposal, the A2Z supervisor followed the APHIS waste container to the disposal site. The supervisor had a spill kit with him in case any cargo was lost. 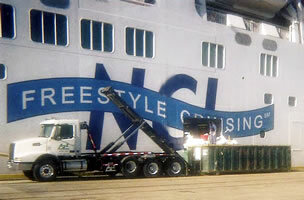 Bleach, disinfectant, brushes, contractor bags, and safety equipment were on hand to clean up any lost cargo. No cargo was lost, but if there had been, strict methodology in the cleaning process would have been followed in order to keep in line with U.S. Customs regulations.